No doubt those of you who follow the international news are aware of the situation that Zimbabwe once again finds itself in: violent protests across the country, a three day national shut-down, supposed to end tomorrow, (but now that ‘Pandora’s box’ has been opened, will it? ), internet blocked (ours, being run through a Belgian satellite, is still fully operational) etc, etc. Doom and gloom! Here we go again! Much prayer needed for a peaceful resolution to the increasing mess. However, here at Montgomery we are fine. We have felt the effects of the crisis but they have only been inconveniences really which we have adapted to…inability to get into Harare for hospital appointments and purchasing supplies, the children’s schools all shut down, delays in some maintenance work we’d planned, etc. Nothing insurmountable and in fact the children think it’s rather wonderful not having to go to school, especially our triplets, Melissa, Melody & Molline who seem to think they were given a holiday especially to celebrate their 7th birthday yesterday! Christmas, which seems an eternity ago now, was as always a great time at Montgomery Heights. Thanks to the generosity of so many of you, the children had a wonderful time. The fun started as usual when an excited ‘delivery team’ gathered outside my house on Christmas Eve to transport huge boxes of gifts to each house. BTW, Len’s white goatee was not grown for the occasion; it’s plastic and attached to the red Christmas spectacles! A number of our older family, who are now working and living elsewhere, came home to share the time with us and Christmas Day saw me once again donning the chef’s hat to cook lunch for 84 - this year thankfully with a steady electricity supply! Wonderful teamwork made the huge task not only possible but great fun, even the washing up! One thing that always really blesses and encourages me on these exhausting occasions is the real sense of ‘family’ that manifests itself so clearly. The government insist on referring to us as ‘an institution’, which makes many of our teenagers quite cross! ‘This is not an institution!’ one recently said indignantly, ’Montgomery Heights is a family!’ and Christmas demonstrates this so well. Something else that has really encouraged us over these past few weeks is the generosity of the local Zimbabweans. These are incredibly difficult times for everyone in the country and yet so many have looked beyond their own needs and reached out to bless our family. I mentioned in my pre-Christmas letter that we were due to collect a donation of ice-cream, cheese and yoghurt. We went expecting 200 yoghurts which seemed rather a lot but were given 500…the children are still eating them! Then a number of different people donated loads of snacks, sweets and fizzy drinks to help increase our annual ‘junk food intake’. As a rather interesting balance to this, a dental technician from a nearby hospital donated her time and skill to come over just after Christmas and carry our dental checks on all of our children. Most encouragingly we were complimented on the excellent state of our children’s teeth. She even checked all of the staff many of whom unfortunately did not get the same commendation! On New Year’s Day a group of ladies in Harare, only two of whom are known to us, clubbed together to pay for a huge bouncy castle to be brought out to us for the day. The weather forecast was rather daunting, with heavy rain predicted but we prayed and the sun shone throughout the day with rain only coming late in the evening. The children had a wonderful time…as did Fiona! Never being one for trampolines, rope bridges or anything remotely unstable under my feet, I opted to supervise and watch from a safe distance! Then just a couple of days ago we received a call from a business-man in Harare to tell us that he has organised for yet another bouncy castle and a huge water-slide to come for the day this coming Saturday and will also be bringing a special lunch for the whole family as well. Such a blessing for the children, though rest assured I shall remain at a safe distance with my feet on solid ground, unless, of course, I am called upon to restrain the nurse! To be honest life in Zimbabwe at the moment feels a bit like we are all on a bouncy castle…everything is completely unstable and there’s no way to tread firmly anywhere. But we continue to have a great sense of excitement about what God is going to do. Without a doubt there are very difficult times ahead for Zimbabwe but we are holding on to two specific words which the Lord has spoken to us for 2019: ‘If you believe, you will see the glory of God’ (John 11: 40) and ‘Lord, I believe, help me overcome my unbelief’ (Mark 9: 24). Pray for us! The greater the impossibility, the greater the opportunity for miracle! With Christmas almost upon us I just wanted to share one last update on Montgomery life for 2018. Firstly, a very big thank you to everyone who contributed financially and ‘in kind’ towards gifts for the children. In spite of the continuing economic and supply problems in the country, due to your generosity we have managed to put together packages which we believe will delight the children next week…toys, books, clothes, back-packs, sandals and of course, the most important thing (to them anyway! ), sweets and chocolates. Their gifts are now all packed and ready to be distributed to the respective houses on Christmas Eve. It has really been a source of amazement to us just what we have managed to access in the current situation. Every time we have come to a point when we had a ‘gap’ that needed filling, either something arrived in the mail or we found exactly the right thing in the shops. It’s been the same with food items. A few weeks ago I announced to the children that we would no longer be able to give them meat for a while as prices had rocketed so high (almost 4 times the previous price); we would now have to substitute with soya protein. Within a week someone gave us money with which to purchase meat for two weeks and then last Friday someone else sent us a huge quantity of beef which will last us for about 3 months, as well as cooking oil to last about the same length of time, and 20 litres of ice cream for Christmas. Tomorrow I am collecting another donation of ice cream, yoghurt and cheese. Our biggest headache at the moment is trying to find sufficient freezer and cold room space to store these blessings! As Fiona has been known to say at such times, ‘It’s hard work managing miracles, isn’t it?’!! For one of our family this will be her last Christmas with us. Tsitsi (Mercy) came to us as a tiny sick baby just over 18 years ago. We have watched the miracle of her life unfold through these past years as she has grown into a strong and responsible young lady. Over the past couple of years she has made a number of familiarisation visits to her grandmother who lives in a rural area some distance from us and during the first week of January she will be moving on to live with Granny. She is excited but, understandably, somewhat nervous. Pray that these last couple of weeks with us will be really special for Tsitsi, that everything the Lord wants to do in her life before the move will be completed and that her adjustment into rural family living will go smoothly. I fed her and of course she has taken up permanent residence. The vet checked her over and proclaimed her ‘a miracle’ for surviving as she did. I have named her Tiqvah, Hebrew for Hope. 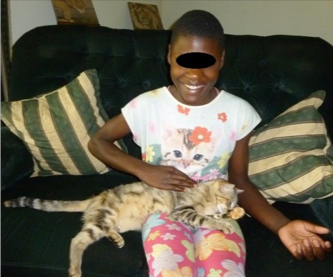 Some of the children are still a little nervous around her, not being used to cats, but others love visiting her, especially Anna (12) who is absolutely besotted and pops in almost every day for a kitty-cuddle. As we close out this year, we still face incredible difficulties in Zimbabwe…fuel shortages, price increases, unavailability of goods, an incredibly complicated and confusing economic situation….but as we look back at the continuing, unfailing timely provision of our needs and the miracles of lives like Tsitsi’s, we move into 2019 with great hope and expectancy. Thank you for continuing on this journey of miracles with us. May this Christmas also be a time of expectant hope for you!